Zastava from Kragujevac, "Krusik" from Valjevo, Belgrade Electro-technical faculty and Sever from Subotica were working on this car for two years. Interesting thing is that this is a first time that invention of Nikola Tesla (Serbian scientist who worked in USA, he invented alternate electric currency and many other inventions which are connected with electric power and which are used today) asynchronized electric engine, which has many different use, is first time in history used in electric car. Such engine has different speeds and therefore it is difficult for regulation: the engine gives power to Yugo Electra but when you are decreasing speed it becomes a generator and it is fills the batteries. Ordinary person can not tell the difference between ordinary Yugo and Electra. 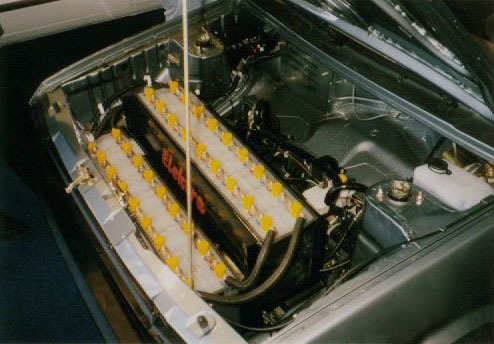 Under the hood is placed the Sever's engine. It is started by batteries made by "Krusik" 140V, 60Ah. Vehicle is made for city drive and with one filling it can be driven for 60-80km. It is a vehicle which is made for public services in the city: post offices, communal services etc. The factory wish to make battery which has half of current size (that is a reason why Electra has room only for 2 people) and to make double or even triple capacity and want to decrease the filling time from 5 hours to 5 minutes if possible. Although such car would have higher price then ordinary Yugo it would cost much smaller money to the driver because it needs only 5kwh of electric power. Yugo electra's maximal speed is 90km/h and it is most economical at 60km/h.